We offer a variety of specials all month long. Every day there is something new and exciting going on at Village Pottery Cafe. So come out and enjoy all that we have to offer. Whether it’s painting your own unique piece of pottery or having a special meal with family and friends, We are here for you. And don’t forget, EVERY THURSDAY is KIDS EAT FREE with purchase of adult meal and drink from 5-8! 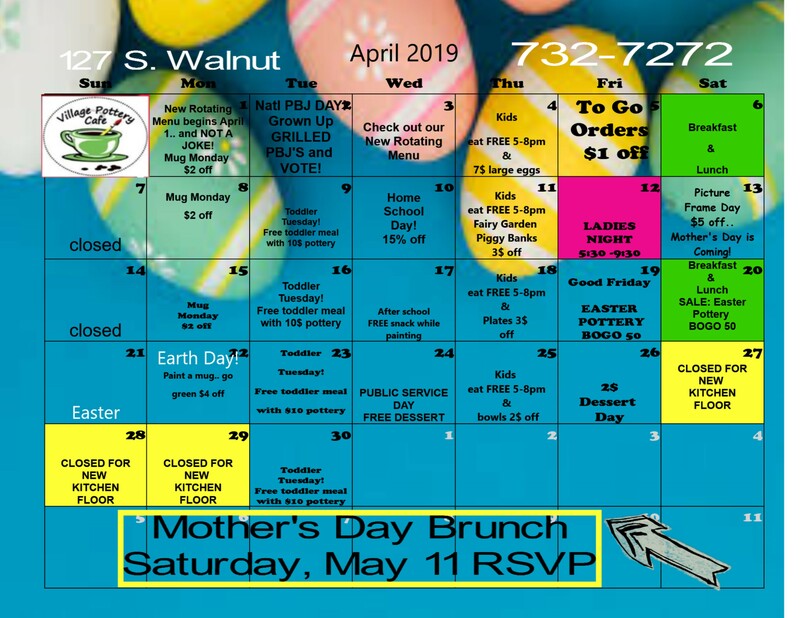 Join us Saturday May 11th for a special Mother’s Day Brunch. There is limited space available so please call today for reservations. Looking for a special way to celebrate your birthday? Let us help you create some special birthday memories at Village Pottery Cafe.